Ready to accept digital (crypto) currency on your WooCommerce store? 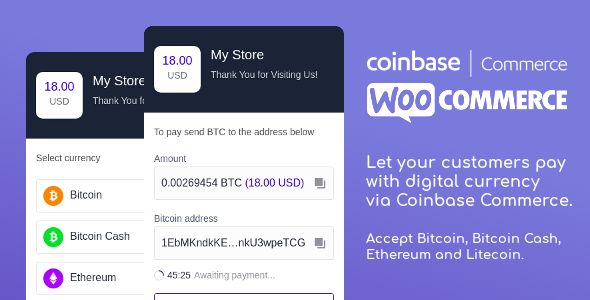 Coinbase Commerce for WooCommerce allows you to start accepting cryptocurrency in a few simple steps. All you need is to sign up for a Coinbase Commerce account and install Coinbase Commerce for WooCommerce on your shop. Payment processing is handled by Coinbase which guarantees a secure and fast payment for your customers. Coinbase Commerce supports four cryptocurrencies: Bitcoin, Bitcoin Cash, Litecoin and Ethereum.